On 5 June 1946, Boeing's Model 462, a straight-wing aircraft powered by six Wright T35 turboprops with a gross weight of 360,000 pounds (160,000 kg) and a combat radius of 3,110 miles (2,700 nmi, 5,010 km), was declared the winner. On 28 June 1946, Boeing was issued a letter of contract for US$1.7 million to build a full-scale mock-up of the new XB-52 and do preliminary engineering and testing. However, by October 1946, the air force began to express concern about the sheer size of the new aircraft and its inability to meet the specified design requirements. In response, Boeing produced Model 464, a smaller four-engine version with a 230,000 pound (105,000 kg) gross weight, which was briefly deemed acceptable. Subsequently, in November 1946, the Deputy Chief of Air Staff for Research and Development, General Curtis LeMay, expressed the desire for a cruise speed of 400 miles per hour (345 kn, 645 km/h), to which Boeing responded with a 300,000 lb (136,000 kg) aircraft. In December 1946, Boeing was asked to change their design to a four-engine bomber with a top speed of 400 miles per hour, range of 12,000 miles (10,000 nmi, 19,300 km), and the ability to carry a nuclear weapon; in total, the aircraft could weigh up to 480,000 pounds (220,000 kg). Boeing responded with two models powered by T35 turboprops. The Model 464-16 was a "nuclear only" bomber with a 10,000 pound (4,500 kg) payload, while the Model 464-17 was a general purpose bomber with a 9,000 pound (4,000 kg) payload. Due to the cost associated with purchasing two specialized aircraft, the air force selected Model 464-17 with the understanding that it could be adapted for nuclear strikes. In June 1947, the military requirements were updated and the Model 464-17 met all of them except for the range. It was becoming obvious to the Air Force that, even with the updated performance, the XB-52 would be obsolete by the time it entered production and would offer little improvement over the Convair B-36; as a result, the entire project was postponed for six months. During this time, Boeing continued to perfect the design, which resulted in the Model 464-29 with a top speed of 455 miles per hour (395 kn, 730 km/h) and a 5,000-mile range. In September 1947, the Heavy Bombardment Committee was convened to ascertain performance requirements for a nuclear bomber. Formalized on 8 December 1947, these requirements called for a top speed of 500 miles per hour (440 kn, 800 km/h) and an 8,000 mile (7,000 nmi, 13,000 km) range, far beyond the capabilities of 464-29. The outright cancellation of the Boeing contract on 11 December 1947 was staved off by a plea from its president William McPherson Allen to the Secretary of the Air Force Stuart Symington. Allen reasoned that the design was capable of being adapted to new aviation technology and more stringent requirements. In January 1948 Boeing was instructed to thoroughly explore recent technological innovations, including aerial refueling and the flying wing. Noting stability and control problems Northrop was experiencing with their YB-35 and YB-49 flying wing bombers, Boeing insisted on a conventional aircraft, and in April 1948 presented a US$30 million (US$306 million today) proposal for design, construction, and testing of two Model 464-35 prototypes. Further revisions during 1948 resulted in an aircraft with a top speed of 513 miles per hour (445 kn, 825 km/h) at 35,000 feet (10,700 m), a range of 6,909 miles (6,005 nmi, 11,125 km), and a 280,000 pounds (125,000 kg) gross weight, which included 10,000 pounds (4,500 kg) of bombs and 19,875 US gallons (75,225 L) of fuel. The YB-52, the second XB-52 modified with more operational equipment, first flew on 15 April 1952 with "Tex" Johnston as pilot. During ground testing on 29 November 1951, the XB-52's pneumatic system failed during a full-pressure test; the resulting explosion severely damaged the trailing edge of the wing, necessitating considerable repairs. A two-hour, 21-minute proving flight from Boeing Field, King County, in Seattle, Washington to Larson AFB was undertaken with Boeing test pilot Johnston and air force Lieutenant Colonel Guy M. Townsend. The XB-52 followed on 2 October 1952. The thorough development, including 670 days in the wind tunnel and 130 days of aerodynamic and aeroelastic testing, paid off with smooth flight testing. 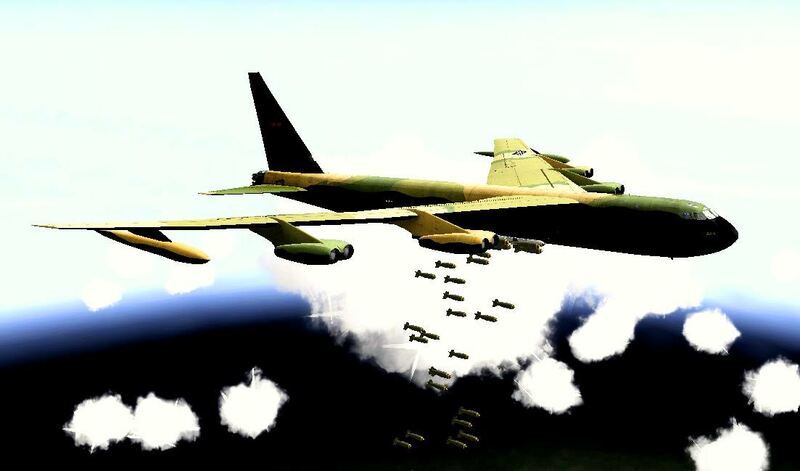 Encouraged, the air force increased its order to 282 B-52s. tructural fatigue was accelerated by at least a factor of eight in a low-altitude flight profile over that of high-altitude flying, requiring costly repairs to extend service life. In the early 1960s, the three-phase High Stress program was launched to counter structural fatigue, enrolling aircraft at 2,000 flying hours. Follow-up programs were conducted, such as a 2,000-hour service life extension to select airframes in 1966–1968, and the extensive Pacer Plank reskinning, completed in 1977. The wet wing introduced on G and H models was even more susceptible to fatigue, experiencing 60% more stress during flight than the old wing. The wings were modified by 1964 under ECP 1050. This was followed by a fuselage skin and longeron replacement (ECP 1185) in 1966, and the B-52 Stability Augmentation and Flight Control program (ECP 1195) in 1967. Fuel leaks due to deteriorating Marman clamps continued to plague all variants of the B-52. To this end, the aircraft were subjected to Blue Band (1957), Hard Shell (1958), and finally QuickClip (1958) programs. The latter fitted safety straps that prevented catastrophic loss of fuel in case of clamp failure. The B-52's service ceiling is officially listed as 50,000 feet, but operational experience shows this is difficult to reach when fully laden with bombs. According to one source: "The optimal altitude for a combat mission was around 43,000 feet, because to exceed that height would rapidly degrade the plane's range." 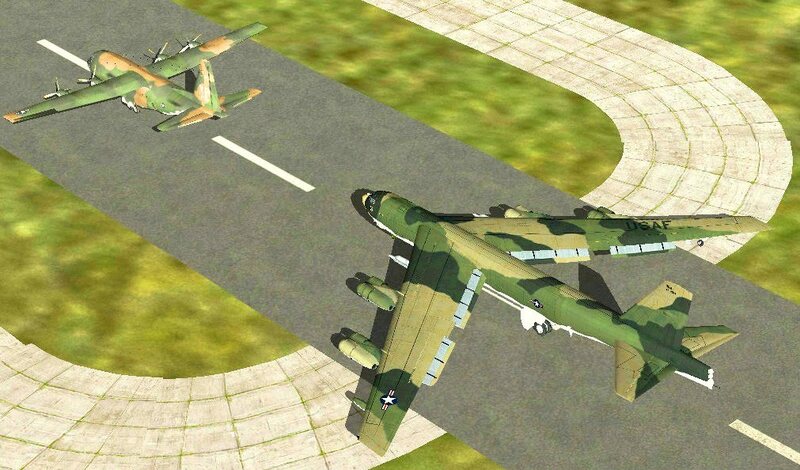 In September 2006, the B-52 became one of the first US military aircraft to fly using alternative fuel. It took off from Edwards Air Force Base with a 50/50 blend of Fischer–Tropsch process (FT) synthetic fuel and conventional JP-8 jet fuel, which burned in two of the eight engines. On 15 December 2006, a B-52 took off from Edwards with the synthetic fuel powering all eight engines, the first time an air force aircraft was entirely powered by the blend. The seven-hour flight was considered a success. This program is part of the Department of Defense Assured Fuel Initiative, which aims to reduce crude oil usage and obtain half of its aviation fuel from alternative sources by 2016. 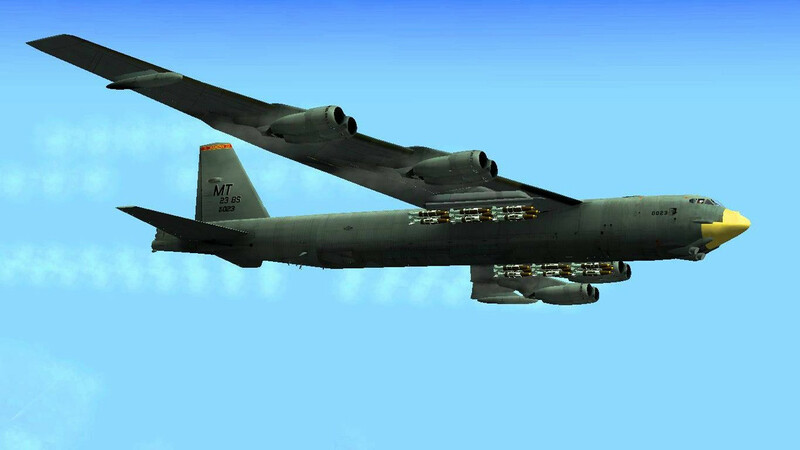 On 8 August 2007, Air Force Secretary Michael Wynne certified the B-52H as fully approved to use the FT blend. B-52DThe B-52D was a dedicated long-range bomber without a reconnaissance option. 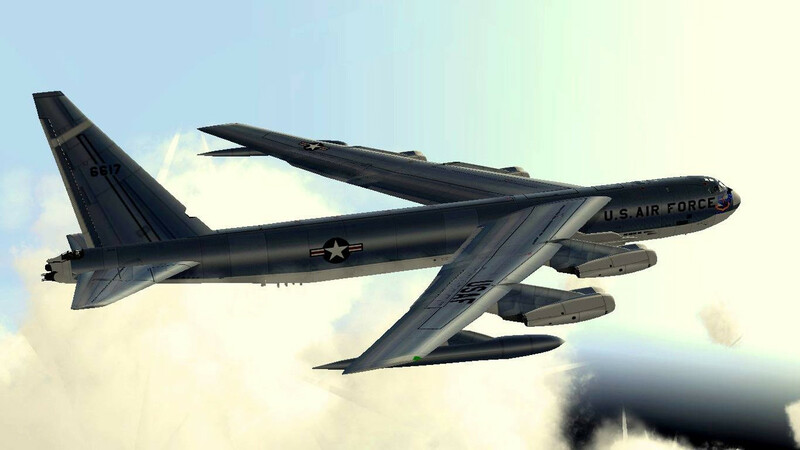 The Big Belly modifications allowed the B-52D to carry heavy loads of conventional bombs for carpet bombing over Vietnam, while the Rivet Rambler modification added the Phase V ECM systems, which was better than the systems used on most later B-52s. Because of these upgrades and its long range capabilities, the D model was used more extensively in Vietnam than any other model. Aircraft assigned to Vietnam were painted in a camouflage colour scheme with black bellies to defeat searchlights. B-52HThe B-52H had the same crew and structural changes as the B-52G. The most significant upgrade was the switch to TF33-P-3 turbofan engines which, despite the initial reliability problems (corrected by 1964 under the Hot Fan program), offered considerably better performance and fuel economy than the J57 turbojets. The ECM and avionics were updated, a new fire control system was fitted, and the rear defensive armament was changed from machine guns to a 20 mm M61 Vulcan cannon (later removed in 1991–94). The final 18 aircraft were manufactured with provision for the ADR-8 countermeasures rocket, which was later retrofitted to the remainder of the B-52G and B-52H fleet. A provision was made for four GAM-87 Skybolt ballistic missiles. The aircraft's first flight occurred on 10 July 1960, and it entered service on 9 May 1961. This is the only variant still in use by the USAF. A total of 102 B-52Hs were built. The last production aircraft, B-52H AF Serial No. 61-0040, left the factory on 26 October 1962. Good god, The Big Brother has arrive,. Many thanx, full Nam campaigns for 1961-1975 possible now. Will be restored later in the day. Am waiting for the new link (first download causes a CTD at 20 % loading the game in JTW/BAT, but unnecessary to discuss this for the moment, as a new version is coming). SAS - May you be with The (Air)Force! For I will never be able to fly this awesome bird could someone pls make a small vid of it!? Thx! You guys are awesome! Looking forward to the Me-264 as well. 4S_Vega I will send to you the final default skins for ALL B-52 versions. I thought you were only going to make this post later in the week and not today. This looks fantastic. Will be looking forward to the new link when it's available. I thought you were only going to make trhis post later in the week and not today. Yes, first released version already have skins you sent me via PM. Link is suspended due other issues, but soon will be fixed.